When working on a construction project, laborers are sometimes needed to toil at relatively high elevations above ground level. 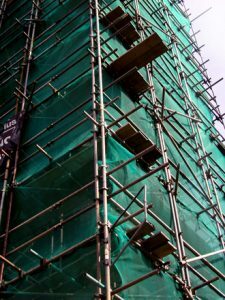 Even on projects that are not in any way considered a skyscraper, falling from the height at which workers are stationed could result in serious personal injury or death. 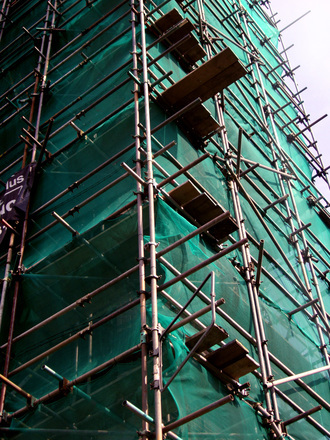 This could be falling off scaffolding, in the case of a building that is being renovated, falling of an exposed beam or rafter in new construction, or falling down a temporary or permanent elevator. A temporary elevator is commonly used at construction sites before the permanent elevators or escalators are up and running. According to the New York Daily News, a worker was recently critically injured when he fell down an elevator shaft. This was his second day on the job, and he was working on a building construction project in Brooklyn.In this case, the victim was a 42-year-old elevator mechanic who was working on the elevator shaft at the time of his fall accident. As he fell down the shaft, he crashed through a series of wooden planks that had been suspended across the elevator shaft and landed on the concrete floor of the elevator pit in the basement at the bottom of this elevator shaft. Workers who were also on the job said they heard a large crash. A plumber who was there said it sounded “like a large bag of fruit” tumbling down the elevator shaft. When this worker and other went to the elevator pit to see what happened, they discovered the victim and first assumed he was dead since he was lying motionless. However, after they had called the paramedics to the scene, they saw that his hand was moving, and they realized that while he was seriously injured, he was still alive. At this point, another plumber lifted him out of the hole. He said he braced the workers back with his arm to keep in him a straight position and pulled him out and laid him on the floor so paramedics could treat him. While this was a very brave move, it should be noted that is best not move a person as it could result in more damage. Anyone who may have suffered a spinal injury should be placed on a backboard by EMTs before being moved, so that the victim is fully immobilized. Witnesses say he had no idea where he was, and he was completely disoriented as paramedics arrived. When paramedics arrive, they typically check to see whether the victim was oriented as to person, place, location, time, and date, which is known as being alert times five if all tests are passed. He was clearly not full alert. He was rushed to a level one trauma center, and while we known he is in critical condition, the extent of injuries has not yet been released. As our Boston workers’ compensation attorneys have seen in various cases over the years, fall injuries at work can often result in serious brain injuries and spinal cord injuries. In some cases, it may be possible to be awarded additional lump sum benefits in addition to the standard workers’ compensation benefits award.